The SAA Portable has two slides, One 90' x 32" wide enclosed tube slide wrapping around the tower into a runout & splash pool & the other 110' x 42" wide open body slide coming from the backside around to the from splash pool.. It can move about 3500 happy people a day, fits in a 100' x 70' space & comes with its own water! The SAA slide can be branded with tower wraps, support wraps, custom pool liner & custom colors to meet anybodies tastes & needs. The perfect promo slide can be rented for a weekend or for multiple events. Also, we'll set it up, take it down & run it for you (yup its fully staffed!) Tech stuff, SAA runs on single phase power or portable power, needs about 3500 gals of H2O which is filtered, heated & chlorinated (we can bring our own water if that helps), needs a fairly flat 100' x 70' space, & takes about 10hrs to set up & 6hrs to tear down. SAA fits into a well packed semi trailer (which can also be wrapped) & it loves to travel! Rental price varies with duration, location & customization. Email us the info, we can figure it out. The SAA is an Event! Whether a private party, corporate promotion, family fundraiser, or summer festival its extremely cool. If you are looking to make a splash, a Big Splash, the SAA will do it! Safe, fun, huge impact, great social media response, all bases are covered. Amazing way to keep cool cats Cooler at Festivals!! This not an inflatable slide, not a cheesy pool slide & definitely not your Grandma's slip & slide!! 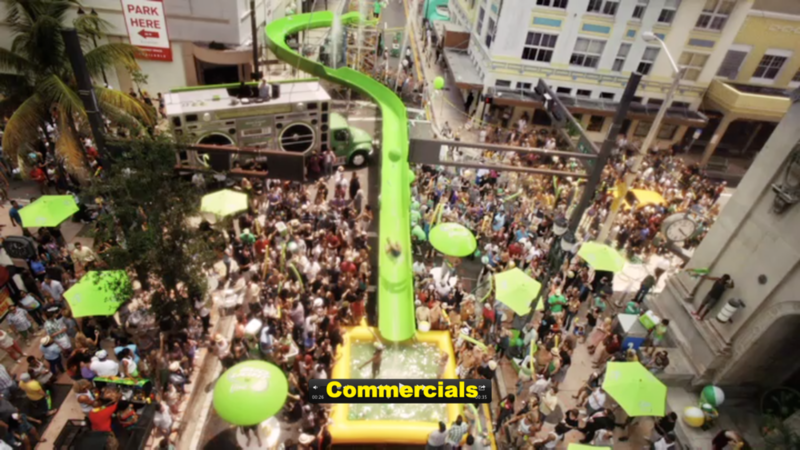 These are actual refurbished commercial water slides! This is all commercial staging (like the stuff you see at concerts.) All start towers & supports are engineered and designed for the SAA application. We know people who do this! Its a Turnkey deal. We love building these & operating these. Its just easier! Our staff is trained to operate the SAA so everybody is safe & really happy! You need to enjoy yourself! We bring everything in & take everything out. We designed it to run on portable power, fixed power, propane, whatever it takes. The portable pump trailer is energy efficient & state of the art pumps, filters, salt water chlorinator & heaters. We contain 95% of the splash pool water & can bring the pool water in & out. We make a living recycling water park equipment, we thought this through.